A well integrated EU market for electricity is key for making the German "Energiewende" a sucess. In challenging times, the EU is discussing how to reform its energy and climate policy for the period after 2020. 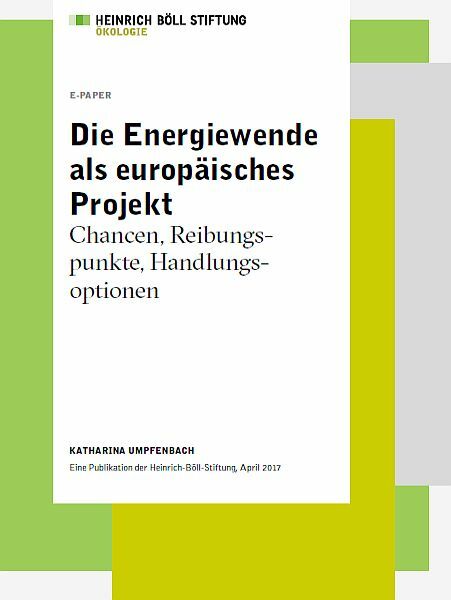 The short study "Energiewende as a European project" looks at the negotiations on the Clean Energy package from a German perspective. Katharina Umpfenbach from Ecologic Institute shows the enormous opportunities of the European internal market. A more developed cross-border electricity market in the EU will make it much cheaper to make the German Energiewende a reality. Yet, to go further and define a joint project for an EU-wide energy transition will require additional efforts to develop concrete objectives and implementation steps together with the other Member States. The study proposes initial steps. The study (in German only) is available for download. Umpfenbach, Katharina (2017): Die Energiewende als europäisches Projekt. Chancen, Reibungspunkte [Energy transition as a European project]. Study commissioned by the Heinrich-Böll-Stiftung, Berlin: Heinrich-Böll-Stiftung.